I am on a roll.... I have all these ideas floating in my head, not enough time to get them all done. Here are few that I did finish. All new additions to my Witty Bitty Collection. This is my Witty Bitty Baby Panda, 3" tall. Witty Bitty Hippo Twins, sitting Hippo is 3-1/2" tall and standing Hippo 3-1/2" tall and 3" long. And this Witty Bitty Baby MollyMoo. This one happens to be my favorite. 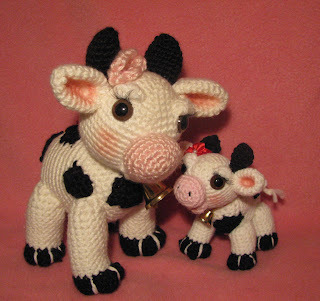 She is the smaller version of my large MollyMoo the Amigurumi Cow. 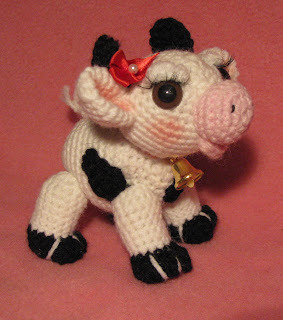 Baby MollyMoo measures 4" tall and 3-1/2" long. All of these patterns are available at my Etsy and Artfire stores and also in Ravelry. My brain is on an overload right now, more new goodies to come!